Should I let my chihuahua off lead? When you have a small toy breed like a chihuahua, letting him off the lead can seem like a big decision. What if he runs away? What if another dog attacks him or what if he attacks another dog or gets stolen? If you live in the United States you have other worries like coyotes, snakes and bears that might see your chihuahua as prey. Some chihuahuas will also chase joggers and cyclists and might even try to jump up and nip at their ankles. Mika used to do this if a jogger came up behind him. I have always allowed my dogs to walk off-lead. It’s something we have done from puppy-hood. Or, as Mika as a rescue, as soon as I felt confident, he would stay with me and come when called. To give this some context, we never walk off-lead near the road or where Mika could be startled because he will react aggressively. The reason I persist with off-lead walking is my feeling that walking on-lead is not really exercise or very stimulating for any dog. It does not allow for spontaneous games of chase or a good run just for the joy of it. Running and playing helps burn off fat, is good for the heart and builds up muscle. Exercise can alleviate some problem behaviours like, incessant barking and chewing. A tired dog is a happy dog. In addition to the exercise there are the social factors to consider. 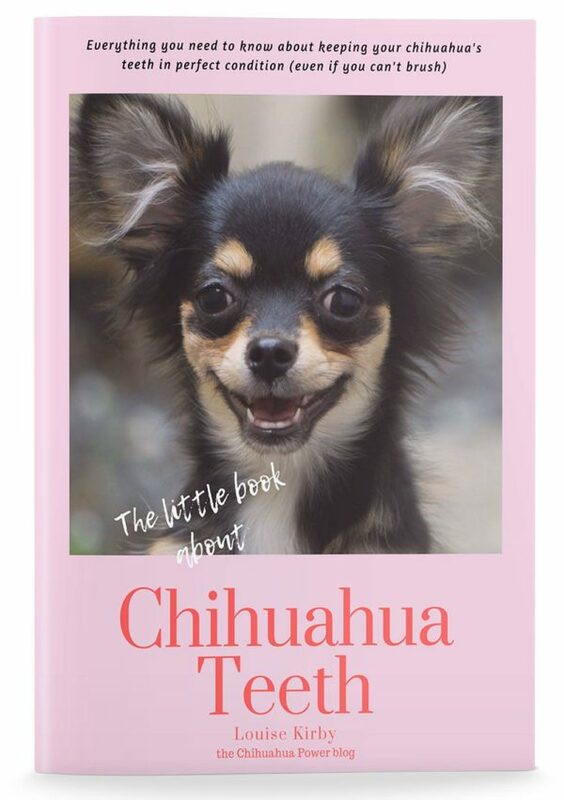 Chihuahuas like a sniff and a dig and to roll in disgusting muck the same as any larger breed. They like to mark their territory and check their pee-mail. Your chihuahua will interact better with other dogs if not constrained by a lead, which can make a dog feel anxious. Some people argue that as chihuahuas are small, just letting them run around in the garden is enough exercise. But, unless he has another dog to play with he is just going to be bored and bark at anything that moves. Allowing your dog off lead comes with responsibility. Walking along engrossed in your phone while your dog wanders about unsupervised is asking for trouble. You are required by law to keep your dog under control. Generally, your chihuahua will want to stay close. They aren’t like some larger breeds that will chase a rabbit or follow a scent. But you need to keep vigilant, especially if your chi is reactive towards other dogs. Parents of small dogs get very upset when large dogs can run at them, but this works two ways. Other dog owners also get upset when an aggressive chihuahua starts to bark or worse snap at their dogs. If you dog is aggressive towards other dogs there is something you can do about it, read this article for some help. 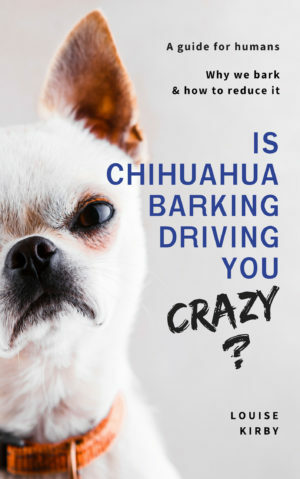 So, if you see another dog walking towards you and you think your chihuahua may react, call him back so he is under your control and put him on the lead if necessary. The same thing goes for joggers and cyclists. Good recall is vital to successful off lead walking, and no dog should be running around off lead if he won’t come back to their owner when called. If you are not sure about your chihuahuas recall, then keep your chihuahua on a trailing training lead until you are more confident, he will come back to you. Picking where you walk is key, walking in a busy local doggy park might be stressful for you and your chihuahua. Can you find a quiet field that has more space and fewer dogs? 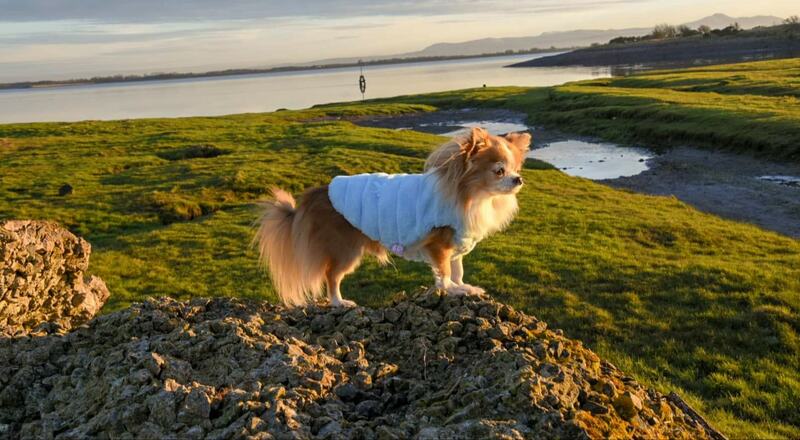 Chihuahuas are known for preferring their own breed, but will tolerate other calm dogs, so why not get together with some friends and hire a secure dog walking field. This has become very popular in the UK. Prices tend to be around £10 per hour. The key to success with any dog is socialisation, enrichment, exercise, training and good nutrition. Chihuahuas are not handbag dogs and in general healthy chihuahuas don’t need to be carried about or pushed around in strollers. It is ludicrous to have to remind people about staying safe when they are out walking with their dog. But dog thefts are on the rise and chihuahuas are still a desired breed. Here are some tips on how to not be a target for dog-nappers. If the worst does happen and you chihuahua gets spooked and runs off, it is very distressing. This happened to Arlo when an aggressive husky ran at our little walking pack. Arlo ran away in the melee and got separated. Here are some tips on how to deal with a lost dog. It’s worth a read as what you would do by instinct is the wrong thing. Previous Post Can my chihuahua catch cold or flu from me? Next Post How effective is CBD oil for dogs? Can I give to my chihuahua?